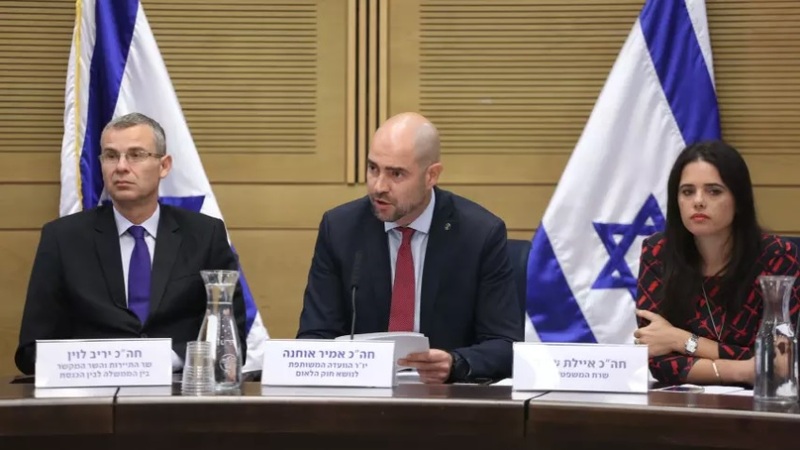 A bill officially defining the nation of Israel as a Jewish state—something that has eluded Knesset lawmakers since the country's inception—has just passed a key Knesset committee and now goes on to the full Knesset chamber this week for the first of three votes. The significance of its potential passage cannot be overstated. The law is a major prophetic turning point, and in my humble opinion, a prophetic signal that the fig tree is now ready for inspection and the times of the Gentiles are near to their end (see also Jeff's latest article). If it passes, I will have no hesitation in concluding that 2018 is as prophetically-significant as 1948 and 1967. The Jewish people will finally have recognized and declared who they are, where they belong, and what a major part of their purpose is, but they will still be missing one key thing: the recognition of their Messiah Yeshua. It will take nothing less than a 7-year tribulation for them to finally acknowledge Him and to accept His atoning sacrifice for their sins. I would be curious what date was it made a state in 48 and when this passes in 18? I read somewhere that the Gregorian day in 1948 that Israel became a State equates to the Hebrew day in 2018 of approximately April 20th. I was thinking something, though not sure what, significant would happen today to get the world's attention. 3/16 - John 3:16. Ok, everybody. Since time is short and today is 3/16. How about sharing John 3:16 with at least one person today! Actually May 14, 1948 was month 3 day 4 (4th of Sivan Omer day 48, http://torahcalendar.com). This is the day Israel traditionally celebrates their independence. Sivan 4 Omer day 48 in 2018 is May 20th not April 20th. 7 days prior to May 20, 2018 is May 13, 2018 which is Ascension Day, the day Jesus ascended into heaven. Now consider this... it was exactly 3 years 7 days (solar) after Germany officially surrendered WWII on May 7, 1945, Omer 38, when Israel became a nation on May 14, 1948 (Germany was a symbol of Israel's laborer in that day). If a generation is 80 years by strength (meaning strength by labor), Ascension Day 2018 would fall exactly 73 years 3 days (Hebrew) after Israel's laborer surrendered. Leaving 7 more years (-3 days), from that date for her to labor to complete the 80 year generation. Another thing I found interesting is that the last listing on torahcallendar.com showing the celebration for Israel's independence is May 26-27, 2020 Omer day 48-49 of that year. I don't know why that is. Is it just a coincidence? Or could it be a subtle hint that by 2021, around Passover of that year, that an abomination of desolation occurs preventing a celebration of independence? Just some thoughts folks, and Please don't get wrong. I'm not setting a date! But one does have to admit that the day counts are very interesting, and that only God can do this! Will we fly home on the same day Jesus did? I don't know, but I do know His time is not far away! Maranatha Dear Family! Look at http://torahcalendar.com That is probably the best Hebrew calendar calculator on the planet. The Hebrew calendar is a 360 day calendar based upon a ~30 day lunar cycle. There are 12 months in a Hebrew year, except during a Hebrew leap year, where a 13th month is added if the full moon of the 1st month is after Passover. Passover is always month 1 day 15 on the Hebrew calendar. The names of the Hebrew months were not added until after the Babylonian captivity, and are actually Babylonian names. If you go to torahcalendar.com they do a very good job of explaining how it is all calculated, and correlate the Hebrew calendar with the Gregorian. A very good site. May 14, 1948 Israel became a nation. This is definitely exciting! From what I'm reading, it looks like the first full Knesset vote will be this week. That vote is very important because it means the final two votes can't be "benched" and must proceed. This is surely prophetically significant. But yet please note this: "Trump postpones his Israel-Palestinian peace plan indefinitely" https://www.debka.com/161569-2/ (3/15/18) Today seems to be as well end of Jubilee year 5777 and 6,000 years since creation fulfilled according to some XYZ calendar (I cannot remember all of them but probably a corrupted one) as brother John from WFTGD channel noticed. Anyway, it must be clear that the days of the church are numbered and grace is now very limited in time... As another brother recently stated: "You can already smell it, the end of the world!" MARANATHA! I think the rapture is what sets everything off. I can't stop thinking of your comment "The significance of its potential passage cannot be understated" because when I saw the new post, I ran to tell the wife with the same mindset. I think this is huge and as usual the "world" hardly blinks. .
Annabel, been a while since I tagged onto one of yours, howdy. The 'word' in alt sources about this non-specified 'delay' or putting the YUGE deal on the back burner is that this is another STRONG confirmation that TPTB KNOW that war in the ME is IMMINENT, abrogating any need to focus, AT ALL, on any agreement which would evaporate shortly anyways. In light of DT's penchant for tackling things which no ordinary mortal man can achieve, his statements around the ME issues on the campaign and his rep as a 'deal maker', of which he is especially proud, it seems very likely that ONLY such a 'behind the scenes' reality would stand between this POTUS and that deal continuing to at least keep moving. Maranatha! I was reading about this also. And, earlier in Pompei (sp.) being for Israel and against the Iran deal versus Tillerson) and possibly a behind the scenes involvement with Israel in striking Syria and/or Iran. I don't know how much stock I'd put in the postponing of the peace plan considering the Palestinians were told they don't have a say in the deal; that the other nations said "the deal isn't up for negotiation, it's for implementation." "Update 3-15-2018 – Palestinians in Gaza plan to erect a tent city close to the border fence with Israel, which will house thousands. The move is part of a planned protest march, which is tentatively set to take place from Land Day (March 30) to Nabka Day or “Day of the Catastrophe” (May 15). Nabka Day laments events surrounding Israel’s declaration of independence, in 1948, which caused about 700,000 Palestinians to be displaced. Land Day commemorates Israel’s expropriation of thousands of acres of land, in 1976, for settlements and security purposes. It’s interesting to me that Land Day-2018 happens to fall on Passover. It remains to be seen if and when the tents will be set up because Israel vowed to take steps to prevent Palestinians from protesting close to the fence, following a bomb that was placed in a flag on the fence. Either way, tensions will probably be raised regarding tents and protests, starting on Passover and extending to Israel’s 70th anniversary." Apparently they will have no choice. Brother Sean (Eschatology Today blog) shared an interesting update on several things. One is that Pres.Trump allegedly postponed the introduction of the peace plan for an undefined period of time (some even mentioned a 2 years delay). Probably preparation for a war is happening. "Update 16 March 2018: Putting this forward about 6 hours early because events could overtake another update done later tomorrow. The war rhetoric is as high as Eschatology Today has ever seen it over the past three or four decades. For example, on the White House website remarks by Lt.Gen H.R. McMaster were made today at the U.S. Holocuast Museum were published. The remarks by LTG McMaster began by noting that this date is the seventh anniversay of the start of the Syrian Civil War and the 25th anniversary of the U.S. Holocaust museum. Odd combination of anniversaries at first glance, but maybe not when seen in the larger context. Syria continues to boil on the brink of a US-Russia military clash; the entire western alliance is strongly condemning Russia for its use of Novichok WMD agents, the most deadly agents of their kind on the planet, to murder one of its former spies, Sergei Skripal and his daughter Yulia, on British soil; hints that a similar attack in New York City is possible; the Israeli military hinting that hostilities could erupt around Gaza at any time in the next couple of weeks, and unconfirmed reports that President Trump has suddenly withdrawn the Israeli-Palestinian peace plan his administration has been pursuing for the past several months for any further consideration. It's as if an imminent war could preempt any peaceful resolution, and the powers that be will pick up the pieces that remain after the conflict has been decided or resolved on way or another. LTG McMaster pointedly noted that Syria today is the scene of "some of the worse atrocities known to man," and went on to say how the U.S. is documenting all of the atrocities being committed by Syria and its allies (Russia, Iran and Hezbollah); how Bashar al-Assad's use of chemical weapons threatens to undo all of the progress made since the end of the First World War regarding the use of WMD, and how Syria, Russia and Iran are all equal to blame for these atrocities. LTG McMaster then specifically stated that the United States, as well as Israel, will not allow Iran to secure a military foothold in Syria. Short of a U.S. Congressional declaration of war, these statements by an American three-star general are tantamount to the Trump Administration toeing the line in preparation to request Congress to so declare such a war, stating that now is the time to act before events spiral completely out of control. The only remaining question is when the action will begin. We know it will occur, Isaiah 17 and Jeremiah 49:23-27 are the prophetic proofs. So is Jeremiah 49:34-39. Sounds like a flood coming. " I'd feel better about the source of the article (Debka.com) having correct info if I heard it elsewhere (Trump, other media sources, etc.). There are many more articles more recent that say to the contrary. I wonder if Israel (and possibly even Trump) through Debka are using this story to push the PA or for some other reasons. When I first saw the article on Debka I believed it, but am now wondering if it's subterfuge. @Nora, Shared this with a few of the team. Pretty astonishing! "Russia’s General Staff see signs that the United States is readying strikes on Syrian governmental forces as carrier strike groups have been deployed for the purpose, Chief of the Russian General Staff’s Main Operations Department Colonel-General Sergei Rudskoi said on Saturday. He added that "groupings of strike carriers that carry cruise missiles have been deployed" in the Mediterranean and Red Seas." Trump is the watchmen chosen by the renegade US nation. He will go up against Russia in Syria and there will US military might be utterly destroyed. You can't argue with Daniel 8.! The US is the King of the South. Russia has been incredibly patiently waiting for the US to wake up out of it's delusions of grandeur. It realises now the pathology of the US cannot mend itself. That war will be the only way. It is far superior to the US in all things military except troop numbers however Russians have a higher average IQ than US. US average is 100. Russian average is 110. And take in mind there are some pretty dumb GI Joes. Ecc, I found that individual to be profoundly beyond my depth many, many postings ago. Sprinkled with interesting geopolitical bits though. The move of Eastern European missionaries into China being one of the largest such efforts in history, by the numbers, gives me pause at some of his points however. Maranatha! Really?! Indeed, thank you for playing. LOL again? That's how the cookie crumbles. MARANATHA! Anabel...anyone can mix in just enough truth to pass their statement off. My issue with comrade Isaac was his love of Russia & the assured destruction of the US by said motherland.....and the belittling of our men and women in uniform. Re: "My issue with comrade Isaac was his love of Russia & the assured destruction of the US by said motherland.....and the belittling of our men and women in uniform." I noticed that too and noticed something else. Comrade Isaac's comments mirror exactly those of African descent who claim to be the real Hebrew Israelites. If you do a search on Youtube for WW3 or destruction of the U.S., it seems to be an opinion disproportionately held by them. I'm guessing izaates bar monobazeus is part of the inappropriately named Hebrew Israelite movement. I am sorry if any of my comments pushed you away Annabelle. I know you are another Annabelle, btw. Could tell by your comments and the spelling of your name. I didn't respond to your comment , but I will now: I am excited with you about the current developments and the article here. and it appears that something is about to happen. JD Farag says the Christians outnumber the Communists in China now. Glory to God ! He also said 80,000 souls are being added to the Church each day ! People are coming to Christ in droves. They see what is going on in the world and truly things are scary out there. They see they need the Savior. God bless all. Nora, it sure is. I have gotten addicted to JD Farag's Middle East updates. He also said millions of Muslims in Iran have accepted Christ. Praise God ! Nora & Archangel, yes, I got stuck on Pastor JD's ME Prophecy Updates about 5 years ago. As for the Move of The Spirit in Islamic Countries and China, Missler's Koinonia House letters were speaking of the conversion of Muslims within unreachable areas by The Holy Spirit DIRECTLY in dreams, visions and possible angelic visitations, with testimonies from those so converted to Chris under threat of death for testifying, as well as the huge evangelical Move within and into China from Eastern Europe. That pot's been cooking a decade, or longer now, Maranatha! Jimboni, I am so glad the Lord directed me to JD Farag's ME Updates ! He is so knowledgeable and his explanation of the so-called "Palestinians" was right on the mark. It occurred to me that each day that so many souls are added to the Church could be the reason, or one of the reasons, that the Lord has not taken us yet. God bless you. I'd like to get everyone's opinion of this video (it's well done and easy to watch). It discusses the idea that keeps coming up and getting dismissed by most that maybe, just maybe the "He" in Daniel 9:27 is not the antiChrist. I'm trying to be a Berean about this. Whole books have been written on this, so very difficult to do it justice here, however there is strong evidence either way for the AC, Messiah and Antiochus. Keil and Delitsch do a great job of breaking this down (although not perfect) in their old testament commentary (one of the best commentaries I have ever (partly) read), and note clearly why they don't believe the 'he' is referring to the messiah nor antiochus. it would have been good if the speaker had referenced forward to Matthew 24 with the discussion, as this provides more context on Daniel 9:27, particularly noting the false christs in Matt 24:4 and vs 22, and then the ref to vs 29 when Christ will appear after the tribulations of those days have come to a conclusion. This, in my mind, cements the fact that the 'he' that is referred to in Daniel 9:27 is coming as a 'false christ', i.e. AC. Great points Ryan. I lean toward the traditional interpretation as well, but am always asking if I'm allowing myself to get caught up in groupthink (not saying others are at all) which oftentimes has me questioning more than I should. I guess that video just tickled my ears into thinking maybe the guy was on to something. I guess unlike His first visit that was prophesied to the day, we are told we'll only know the season for the rapture. It sure feels like we're in that season to me and at the very end of it (for the rapture) but who knows. I wish I knew what approximate year Christ was referring to as the start date when he said he would revive us after two days (2,000 years). I hope it wasn't the crucifixion date because then we have too much longer and hope there is a clue to an earlier date we're all missing even though I know the rapture could happen sooner with a gap before the 70th week. We are watching the fall of the Great Whore of Babylon aka Great Britain. The UK will fall in the aftermath of the UK governments blood libel against Russia. Izzy, are you one of the 13 ??? Izaates bar Monobazeus was a king of the Jews. He hailed from Arbel on the black sea coast. Translated into English his name would read: Jesus, son of, the only son of Zeus. I use the monicker in an effort to point out to you how much ancient history you are unaware of. I am not negroid. I am of Caucasian heritage. I study ancient medical and religious texts. I live mostly in Australia. I believe Jesus is Lord. I don't think patriotism is an adequate fig leaf for apostacy. I think the US is being filled into destroying itself in a war it cannot win because the role apportioned to the US in prophecy has become quite evident. It has elected a watchman, as per Daniel 8, and he came with a warning for his people....peace and prosperity he promised, but now...now...he is doing a u-turn, as per Daniel 8, and he has set a path for himself to go up against the king of the north (Damascus), as per Danial 8, and despite everything you may like wish or want to believe Damascus will defeat him, as per Daniel 8, Trump the watchman is the fierce king who thinks he is superiot , as per Daniel 8, Israel will lose the Gola, as per Daniel 8. Dear Ecc, take your hand off my cart. You have no business bringing disgraceful insinuation to a discussion the nature of which we attempt here. It is thoroughly unhelpful and beneath one claiming rebirthright in Christ. The Fakestinians are planning a six-week march of millions against Israel leading up to Israel's 70th anniversary. This is gonna get interesting fast!